We recently had some firewood delivered and it got me thinking about what else I could do with all of that beautiful wood stacked up so neatly on my back porch. I chose a log that was smaller and had some "prettier" bark with character. I also liked that this one had a little stump on the side. I thought it made it look more interesting. 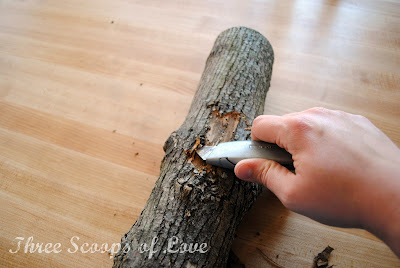 The original log I chose was a little long and not even on the ends, so I cut off both ends with a chop saw. It's never going to be perfectly straight, but as long as you can get it to stand up, it will work. 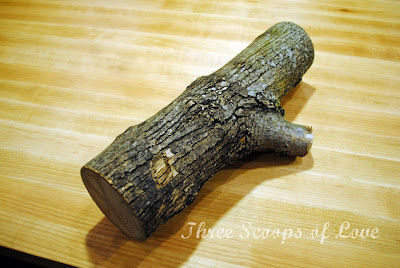 I would recommend using a log that is very dry and still has the bark pretty attached. If the bark is falling off very easily, it will be hard to carve your heart. I cut a rough heart shape out of paper and laid it on top of the log. 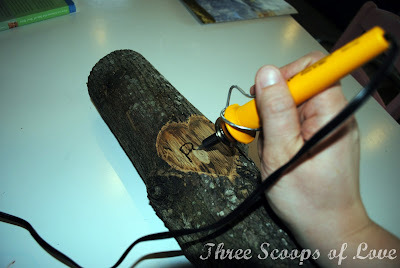 I took an old, rusty utility knife and started scoring around the heart shape. You can't really cut through the bark, so I just pushed it in as far as I could until I had a series of line cuts all the way around the heart. 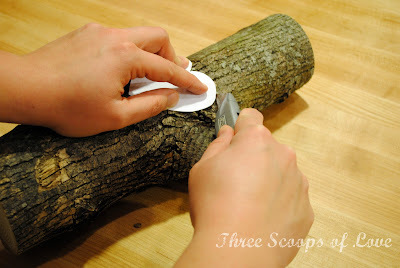 Then, I took the utility knife and started chipping away at the bark. I kept going back and making my heart outline cuts deeper as I went. I kept going until I had a fairly good heart shape and the layers of bark that I had removed were pretty even. Then, I took a sheet of sandpaper and tried to smooth out the heart surface the best I could. 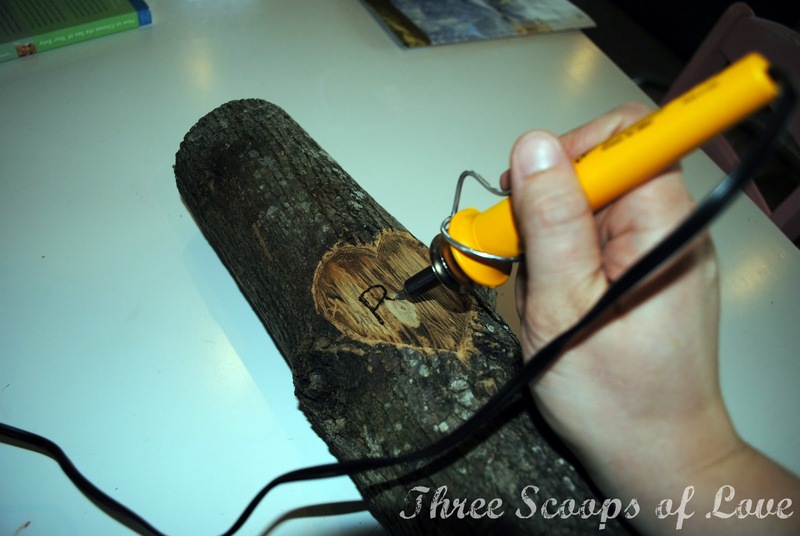 The smoother your surface, the easier it is to get an even line with your woodburning tool. I drew out my letters lightly with a pencil and heated up my woodburning tool. I got this for Christmas and was anxious to try it out. I had never used one before, so I did a little practice on the ends I cut off the logs. It was pretty simple, just remember that you can always go back and make it darker, but you can't lighten your lines. As you can see, it's not perfect, but that's okay with me. I went back over my letters several times to try to even it out and clean my lines up. I also added the dots around the edge for a little border. 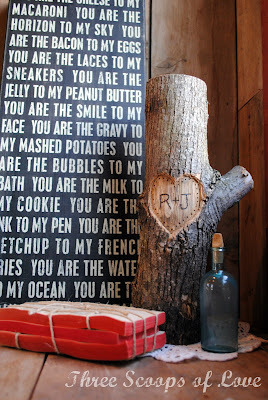 Perfect for Valentine's Day, but I think it will live in our bedroom all year long! Saw you on TT&J. I was scanning the link party and my son saw this and wants me to try it with all our family initials. Thank you for the idea! I LOVE this! You did such a wonderful job! Visiting from TT&J. This is really cute! Great job! What a fun idea. So cute and it looks lovely with your subway art. 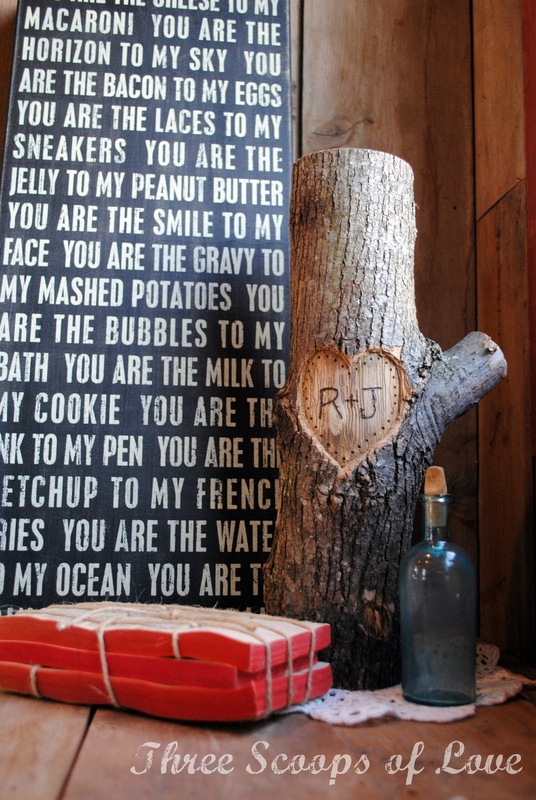 Romantic and rustic equals perfection. Nicely done! That's cute and romantic too! Thank you, everyone! Have a great weekend! 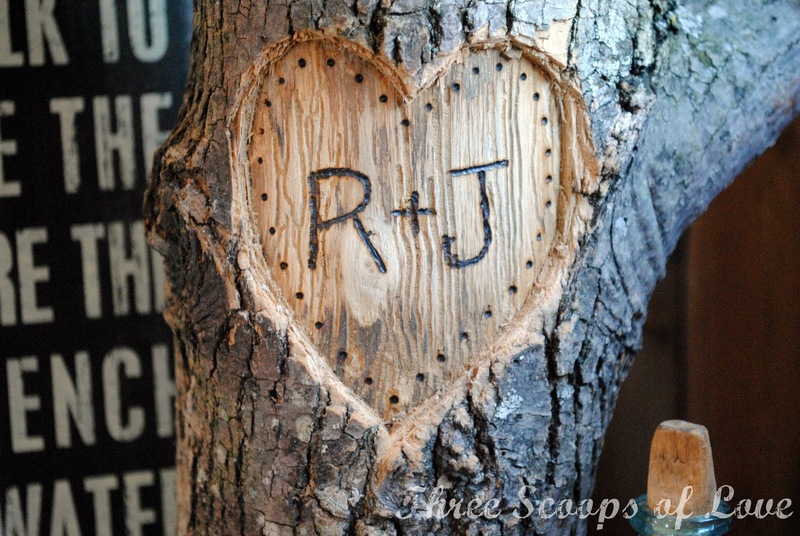 Oh my gosh, that is just the cutest idea! You did such a great job! Would you consider sharing this adorable project at my party? This is so adorable, I love it! I really want to make one! 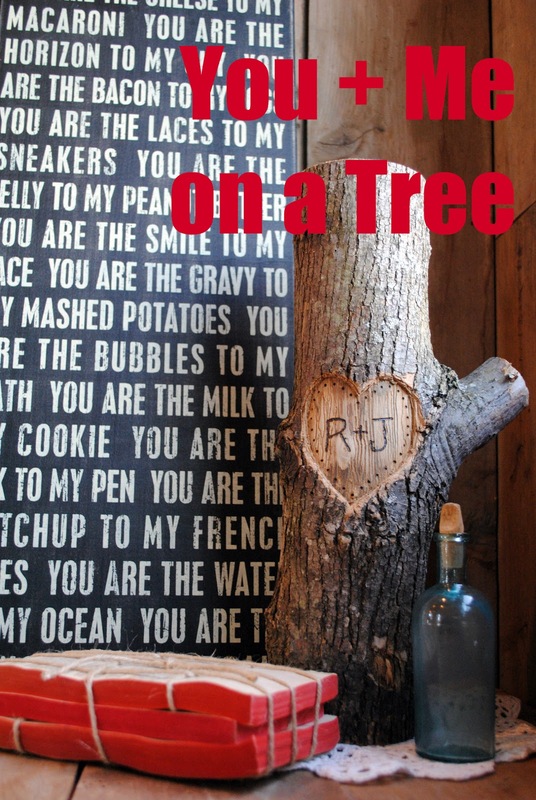 I'm thinking of a woodland theme for my babies nursery and this would look perfect in there! Oh my goodness! This is amazing!! I'm featuring this at our Shine on Friday Party and pinning this. Thanks for sharing and inspiring us!! Absolutely brilliant! Pinning this on my Valentines board. So glad I saw your post featured over at Flamingo Toes! I still love this - I really need to get it made this year!! I did a roundup of my Six most popular featured projects from 2012 and this tutorial made the list! Thanks so much for linking it up last year! For someone who doesn't get wood delivered.... What's a good suggestion on finding a good log? Go to a sawmill. Many times, they have ends they've cut off.